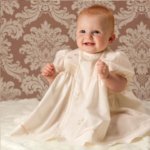 Description: As delicate as a newly opened blossom, this glorious cream baby dress features a beautifully shaped front panel, gently ornamented with dainty embroidery. Tiny baby pink rosebuds twine amongst cream shadow work, echoing the satin ribbons threaded through the sleeve and hemline beading. Lace edges the sleeves and neckline and the dress buttons at the back.